This has been one of my favorite projects. I really loved working on the design, even though it took me several weeks just to imagine the patterns — and then to realize what I had imagined. I received a request for two large circular windows, each with diameter of 180cm (approximately 71"). The size was the only condition given by the customer. She gave me free rein regarding the design and the colors, as long as the windows matched in some way. When I started to think about what kind of illustrations should fit this shape and size, the first thing came to my mind were the big clocks seen on old buildings. I always liked ancient clocks and the concept of Time, so I thought it could be a great theme to work with. I envisioned two windows, one with the time in the heavens, illustrated by the signs of the zodiac, and the other with the time on earth, illustrated by the passing seasons. It took me a long time to find suitable pictures of each constellation, so to prepare this design was hard but enjoyable work. After I finished the patterns and sent them to the customer, we both had a surprise because it turned out that she is explores astrology in her free time. Glass Eye 2000 helped me a lot, mainly in trying a lot of color combinations quickly, which would have been very complicated with hand drawings. I really like the geometric features of this program for making precise straight lines, circles, right angles, etc. It helps me to do symmetric patterns accurately, which is very important in stained glass art. Last but not least, it is useful to print out a cartoon to use for the construction, so my artwork will be the same as the pattern. My customers love seeing the full-color renderings I make with Glass Eye 2000; they look so much like real glass artworks. They can easily imagine them in their homes and buildings, so there are no unpleasant surprises when they first see my creations. My "Earth and Sky" design has yet to be constructed, so let me instead share with you some photographs of a four-sided lamp I constructed recently. 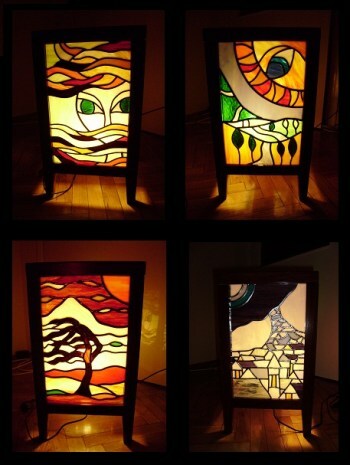 I call this lamp The Four Seasons. Can you match each photo with a season? 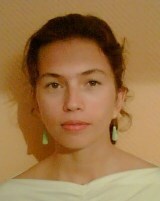 Laura Ludvig lives in Hungary. She studied environmental engineering at her university, but has always had an affinity for the visual arts. She is a founding member of a Hungarian art group uniting artists from a wide range of disciplines: literature, music, painting, photography, etc. Serendipitously, Laura met Straja Marjanovic, a stained glass artist associated with one of the most famous European glass studios. He invited Laura into his glass workshop where she began her formal training. Eventually she formed her own glass workshop in Budapest. Please visit her website or contact her by email.